What is Thumb CMC Arthritis? Thumb CMC arthritis can occur from wear and tear or may follow injury of the joint. Arthritis is loss of cartilage (cushioning material) between the bones resulting in bone-on-bone contact. Loss of this cartilage results in pain and range of motion is sometimes limited. In severe cases, the joint may become unstable resulting in a boney “bump” at the base of the thumb. When the carpometacarpal joint (CMC) at the base of the thumb becomes painful from overuse or arthritis, your surgeon may recommend thumb arthroscopy (looking at your joint using a tiny video camera) to diagnose and even treat your problem. When you undergo the arthroscopic procedure, your surgeon can better understand the extent of your condition and may find less invasive options that can eliminate your symptoms. Mild cases of thumb CMC arthritis may be treated with splinting of the thumb, avoiding aggravating activities such as pinching, anti-inflammatories, therapy, and/or cortisone injections. While non-surgical treatment can relieve mild cases of the condition, surgery may be necessary if it continues to worsen. Orthopaedic hand surgeon Tyson Cobb, MD performs arthroscopic CMC surgery as a minimally invasive method of relieving thumb CMC arthritis pain. During surgery, small (approximately 1/4 inch) incisions are made at the base of the thumb through which an arthroscope (small video camera) is inserted to allow Dr. Cobb to view the surgery on a monitor. Special instrumentation is used to remove the arthritis. This technique results in smaller incisions, less scarring, less pain, faster recovery and usually no stitches. 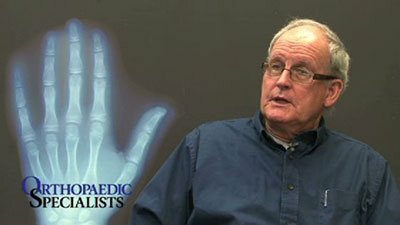 Studies have shown that Dr. Cobb’s technique (which is the only minimally invasive treatment option for severe, end-stage thumb arthritis) results in return to normal activity/work in approximately one half of the time required for the open procedure. Dr. Cobb’s publication on minimally invasive treatment of thumb arthritis was 1 of 5 top downloaded articles for 2016. The older traditional CMC open surgery is also known as LRTI, which stands for Ligament Reconstruction Tendon Interposition. LRTI requires a large open incision and removal of the entire trapezium bone. 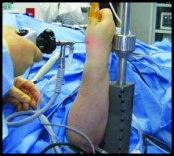 Then, a second incision is made to remove a tendon from the arm. 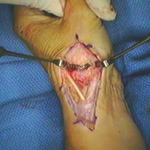 This tendon is used to fill the gap left by the removed bone; a surgical pin is often used. A cast is typically applied for 4-6 weeks. This older traditional method has many disadvantages including potentially large painful scars, long recovery times, and thumb motion is often limited.